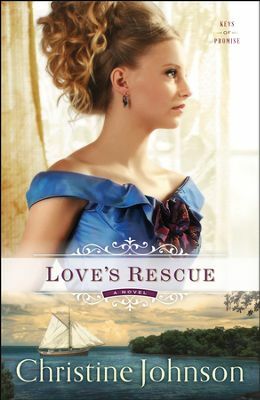 If there is one thing I will remember about Love’s Rescue by author Christine Johnson, it will be the many intense moments that add so much life to this novel. By no means is this a dull book with little action. Love’s Rescue is more of an action packed love story with enough anxious moments to keep you turning the pages. In this novel, Elizabeth Benjamin is forcing her way back into her father’s life after several years away living with her cranky aunt. Elizabeth is compelled to return home and help care for her brother who was injured because of her actions years prior. She is also anxious to see the love of her life, Rourke O’ Malley. On her return trip home, she is rescued by Rourke but soon realizes their love is one of impossibility. While I did love the action in this title…I so wanted more time spent between Elizabeth and Rourke. I think this is my common compliant about love stories. I like to read the love part and see the relationship develop. Also, there were so many times I wanted to strangle Elizabeth, and her aunt. Mostly her aunt. Overall Love’s Rescue is a great read for this summer. You will no doubt enjoy its Key West setting and fast paced action scenes. I was given a complimentary copy of this book by its publisher in exchange for an honest review. All opinions are my own and I have not been compensated.